The easiest way to tell if someone’s puffy jacket is filled with down or synthetic? Ripples. The ones that make every down jacket wearer look a bit like the Ghostbuster Marshmallow Man. In industry lingo it’s baffles, sown dividers throughout the jacket that keep the feathers and fibres in place. Without them all the down would settle to the bottom of the jacket. Even with baffles, down tends to migrate into clumps leaving cold spots. Not any more. The Eddie Bauer EverTherm Down Hooded Jacket is a down puffy without a baffle in sight. The EverTherm is stuffed with Thindown, a new method of turning feathers into a batten. The down is bound together and pressed into sheets that look like synthetic insulation but is far warmer for its weight. Aptly named, Thindown is only about a centimetre thick, but in testing over the summer I found it packs the equivalent warmth to a traditional down sweater or thick synthetic puffy. Both are much bulkier looking. 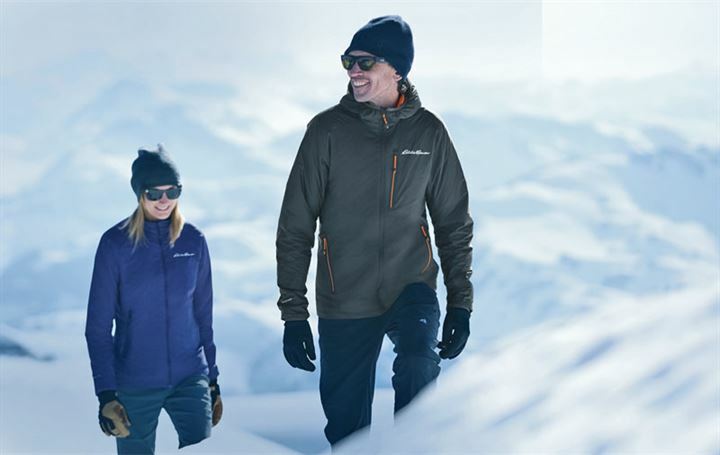 For skiers this is noteworthy because the EverTherm is a great layering piece for backcountry skiing and for cold days at the resort. The exterior nylon is a tight weave treated with a durable water repellent coating. On its own it beads up light rain and shrugs off wind. It’s not very breathable, so not ideal for hard ski days. But when the temperature plunges and you need reliable warmth this thing packs a ton of insulation into a light and non-bulky package. That means fewer layers needed, so better mobility. On backcountry ski missions, the sheet construction is not as packable as down alone. Stuffed as small as I could it was the size of a big grapefruit. Unfurled it layers well under a shell and easily slides over a baselayer or two. At $280 it’s about average for a down filled, lightweight jacket. And the technology inside is a pretty cool step forward, especially if you don’t like looking like you’ve eaten one too many apres poutines just so you can stay warm. Eddie Bauer has a two year exclusive on the Thindown technology. If you want to try it the EverDown is the only game in town and a solid premiere. RYAN REPORT is a frequent web post by Ski Canada magazine’s technical editor, Ryan Stuart.